REPLICA 15TH CENTURY BOARDED CHEST handmade from kiln dried English oak, designed and built to conceal a modern central-heating radiator. The tracery carving is pierced right through, allowing warm air to circulate freely. Boarded chests were constructed out of sawn or riven planks simply nailed together. The Middle Ages witnessed their heyday and many were highly valued pieces commissioned by wealthy patrons. Boarded furniture, which includes stools, benches, cupboards, shelves, boxes and armchairs, declined in social status from the latter part of the Tudor period although continued to be made right up until the 19th century, albeit in a more utilitarian mode. 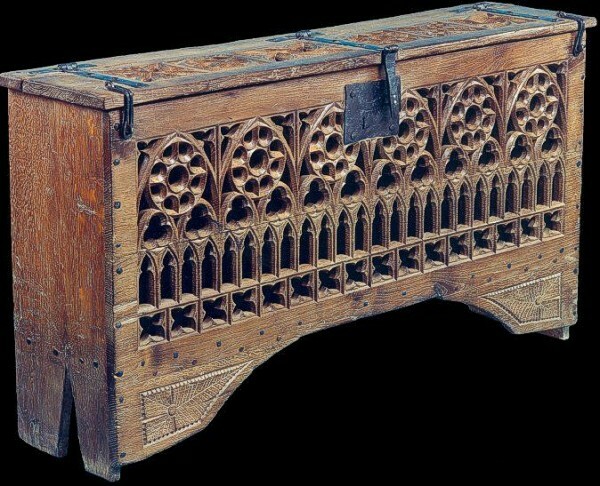 Early Gothic boarded chests are extremely rare and prices are high for good original examples, anything from £12,000 at a provincial auction to upwards of £70,000 for an exceptional piece at an early oak specialist!